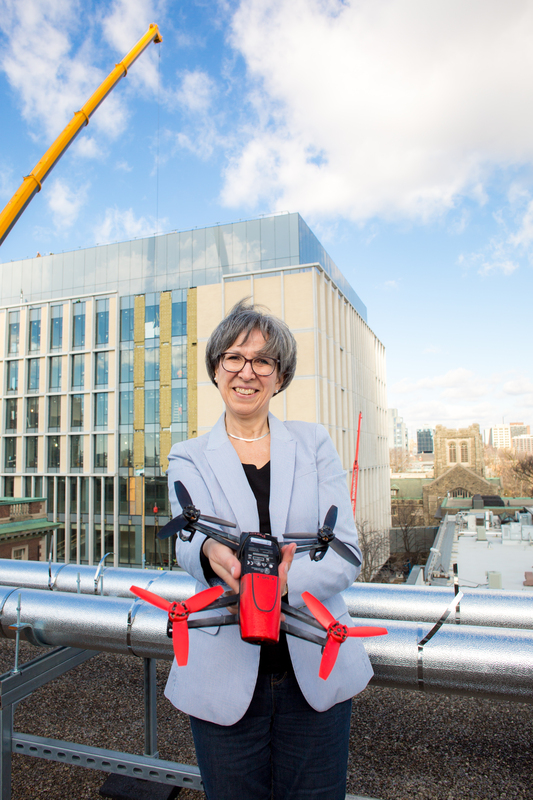 Professor Brenda McCabe conducts her research in the field, collecting data to develop analysis tools to make the construction site and construction process safer for workers and site visitors. Her work has involved providing consultation to the Toronto Airport Authority on the major renovations recently made to Pearson International Airport and collaborating with the Ministry of Transportation of Ontario to assess the impact of highway construction on traffic. A variety of construction firms apply her research findings to improve the safety and efficiency of their construction processes. Professor McCabe is also the director of the Building Tall Research Centre (BTRC), a newly developed partnership between academia, industry and government that will act in an advisory capacity to the profession. The express mission of BTRC is to cluster, highlight, and promote research related to tall buildings from multidisciplinary technical perspectives. These areas include, but are not limited to, building science, construction, environment, geomechanics, materials, resilience, structures, sustainability, and water resources. Refereed Journal Papers J.26 Chen, Y, McCabe, BY and Hyatt, D., 2017, “Impact of individual resilience and safety climate on safety performance and psychological distress of construction workers: a case study of the Ontario construction industry”, Journal of Safety Research, 61:167-176 dx.doi.org/10.1016/j.jsr.2017.02.014. Conference papers and presentations C.35 Naji Almassi, Ali , McCabe, BY, 2008, “Image Recognition and Automated Data Extraction in Construction” Proceedings of the Canadian Society of Civil Engineering 2008 Annual Conference, Quebec, QC, June 11-13. Conference papers and presentations C.34 McCabe, BY , 2008, “Safety in the Ontario Construction Industry” Proceedings of CIB W99 Evolution of and Directions in construction safety and health. Eds Jimmie Hinze, Suezann Bohner, and Jeffrey Lew. Gainesville FL March 9-11. An introduction to the management of construction projects including: the nature of the industry, project delivery alternatives, legal and ethical considerations, the Safety Act and construction regulations, labour relations, construction contracts, risk distribution, project planning and scheduling, estimating and bidding, controlling of time, cost and quality, accounting leading to financial statements, dispute resolution, as well as new and evolving concepts in managing construction. Course Objectives	In this course, students will learn ways in which data can be modeled in the application of construction management: probabilistic and process. Simulation modeling – students will learn how discrete event simulation engines work. They will learn to build a model for a construction operation, understand their strengths and shortcomings, and process input and output data. *** Created this new course. It has resulted in many positive outcomes for students. 2001 CV206 PEO Upgrading Management of Construction – Developed and presented Professional Development Centre course for engineers seeking PEO registration. Redevelopment of course to focus half of its resources on new technologies that will support the estimator and the estimating process. This course will be further developed to include financial analysis. Re-established the lecture series, coordinated presentations by industry experts, ensured academic content.